The 34 metre high hill opposite the entrance to the Ephesus Stadium. Tracheia - the "Ephesus Acropolis"? The area is unfenced but overgrown, with a rough track beaten by curious feet (probably those of a few die-hard archaeology fans). You can wander around, but the remains are not easy to make sense of without a detailed plan. An information board - with a plan - informs visitors that ceramics found in this area prove the existence of a settlement here as early as 750 BC. The archaeological finds and as well as topographical and literary evidence have led to the theory that this hill may be the location of the original Ionian Greek settlement of Ephesus, known in the foundation myth as the "Tracheia Mountain" (Τραχεῖα, Rough) (see gallery page 22), which at the time of the first Greek colonists may have been an island or peninsula surrounded by the sea. The hill has even been dubbed the "Ephesus Acropolis" or "Ionian Acropolis". "At a subsequent period Smyrna also was added to the Ionian association at the instance of the Ephesians, for anciently they inhabited the same city, at which time Ephesus was called Smyrna. Callinus somewhere gives it this name, and calls the Ephesians Smyrnaeans in the address to Jupiter: 'And pity the Smyrnaeans'; and in another passage, 'remember now, if ever, the beautiful thighs of the oxen [which the Smyrnaeans burnt in sacrifice]'. The mountain Prion was called Lepre Acta; it overhangs the present city, and has on it a portion of the wall. Even now the farms at the back of the Prion retain the name in the term Opistholepria. The country along the foot of the mountain about Coressus was called Tracheia. The city was anciently built about the Athenaeum, which is now beyond the city, at the (fountain) Hypelaeus. Smyrna therefore was situated near the present gymnasium, at the back of the present city, but between Tracheia and Lepre Acta. The Smyrnaeans, upon quitting the Ephesians, marched to the place where Smyrna now stood, and which was in the possession of Leleges. They expelled these people and founded the ancient Smyrna, which is distant from the present city about 20 stadia. They were themselves afterwards expelled by Aeolians, and took refuge at Colophon; they then returned with a body of men from the latter place, and recovered their own city, Smyrna. Mimnermus relates this in his poem of Nanno, and says of Smyrna, that it was always a subject of contention; 'after leaving Pylus, the lofty city of Neleus, we came in our voyage to the long wished-for Asia, and settled at Colophon, and hastening thence from the river Astëeis, by the will of the gods we took Aeolian Smyrna.'" 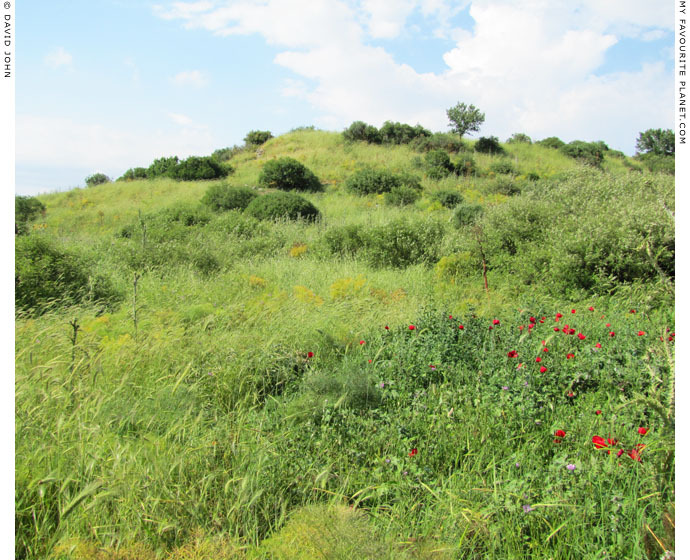 If this hill is the Tracheia, then the "Crevice temple" may be the temple of Athena and the Byzantine fountain may have been built over the Hypelaios spring. 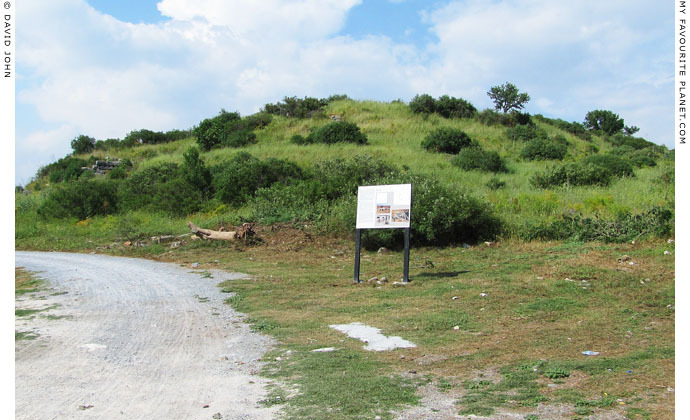 Many researchers believe that the Ayasuluk Hill (now in Selçuk) was the first location of Ionian Ephesus. Certainly its height made it a strategically better choice for an "acropolis", and archaeological evidence indicates that the hill had been inhabited since at least the Bronze Age (see A brief history of Ephesus). In this respect, even the 130 metre high Mount Pion would seem preferable to the Tracheia Hill. Pausanias wrote that Androklos, the legendary founder of Ephesus, "expelled from the land the Leleges and Lydians who occupied the upper city". The term "upper city", however, may have referred to all or some part of the city of Ephesus of his time (the area of Ephesus archaeological site), in comparison to the lower area of the Sanctuary of Artemis. There may have been a number of reasons why the Ionian Greeks did not make their first settlement there. If we are to believe the account of Kreophylos, mentioned by Athenaeus (see gallery page 22), "the founders of Ephesus, after suffering many hardships because of the difficulties of the region, finally sent to the oracle of the god and asked where they should place their city." He does not tell us what these hardships and difficulties were. Although Strabo and Pausanias tell us merely that Androklos and his Ionians took Ephesus from the native Carians, Leleges and Lydians, it may not have been a quick conquest and perhaps took some time. Pausanias (Book 7, chapter 2, section 9) also tells us that Androklos was later killed when fighting with the people of Priene against the Carians. The natives, then, were able to put up a fight for their land for some years. It may be that the Ionians were unable to take Ayasuluk Hill, and decided to settle first at Tracheia while they were still at war or even besieging Ayasuluk. The Tracheia hill had its own natural defensive advantages, particularly if it was an island or peninsula, a harbour (referred to by Athenaeus as the "sacred lake" or "sacred harbour"), as well as fresh water in the form of the Hypelaion spring. location of the first Ionian Greek settlement at Ephesus. See accounts by ancient authors of the foundation of Ephesus on gallery page 22.
and the northwest side was used as a quarry. wild flowers which covered the sparse remains of ancient walls and buildings. Macellum (μάκελλον, makellon; plural: macella), an indoor retail food market, where meat, fish, fruit and vegetables were sold. The macellum at Ephesus, dated to 200 AD, is often referred to as a meat market by modern authors. The remains consist of the rock carved socle of a circular structure with 12 radial walls. It stood in the centre of a square colonnaded courtyard measuring 65 x 65 metres. The early Byzantine fountain house, southeast of the macellum, had a forecourt and an open colonnaded courtyard. The foundation of the Hellenistic "Crevice temple", built around 400 BC, is on the northwestern foothill. The geography of ancient Ephesus is complicated by the various modern interpretations of the sparse evidence from the city itself. Mount Koressos (Turkish, Bülbül Daği, Nightingale Mountain) is the high, long hill on the south side of the city, while Mount Pion (όρος Πίων; Turkish, Panayır Daği) is the lower hill to the north. The upper city of the Hellenistic and Roman periods (the area from the Magnesian Gate and the Upper Agora down to Kuretes Street) stands between the two hills. Some researchers have placed a district named Koressos either directly in front of the Stadium or on the northeast slope of Mount Pion (later the location of the Cave of the Seven Sleepers), with a "Koressos harbour" to the east of the Stadium. The city gate to the north of the Stadium is known as the Koressos Gate. A district named Smyrna has likewise been placed to the west of the Lower Agora, and one named Prion on the north slope of Koressos. Many scholars since the time of John Turtle Wood have believed Mount Koressos to be Mount Prion, and Mount Pion to be Mount Koressos. Maps and plans of Ephesus over succeeding generations have given different names to various districts and topographical features, and no map I have seen tells the whole story. All very confusing. Strabo, The Geography, Book 14, chapter 1, section 4. Translated by H. C. Hamilton and W. Falconer. George Bell & Sons, London, 1903. At Perseus Digital Library. Kallinos (Greek, Καλλῖνος; Latin, Callinus) was an Ephesian poet of the mid 7th century BC. Hipponax (Ἱππῶναξ) was an iambic poet of the 6th century BC, from Ephesus and later Clazomenae, who composed verses depicting the vulgar side of life in Ionian society. 4. Pausanias and "the high city"
Pausanias, Description of Greece, Book 7, chapter 2, section 8. At Perseus Digital Library. See a longer quote from this passage on gallery page 22.
originally appeared in 2004 on davidjohnberlin.de.